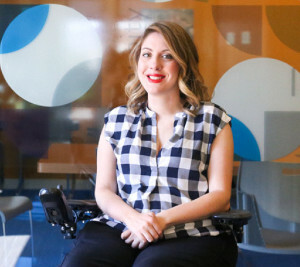 This fund was established in memory of Candice N. Minear of Kansas City, Missouri by The Whole Person to provide educational scholarships to people with disabilities who have been accepted into the Masters of Public Administration Program at the University of Missouri Kansas City (UMKC) (the same program as Candice Minear graduated from) and whose interests and values most align with those of the late Candice N. Minear. Funds may cover tuition, books, and fees. In the age range of 20-45 years. A person with a disability. Accepted to, and/or attending the Masters of Public Administration program at UMKC. This program prepares entrepreneurial and innovative public service leaders and executives to be effective and successful in an increasingly complex and dynamic world, and to effectively and ethically lead and manage dynamic public service organizations. Possess a minimum 3.0 GPA on 4 point scale. Passionate about learning and able to articulate how their education will be used; illustrated by writing an essay about the personal attributes and characteristics of the student that indicates their ability and commitment to persevere to degree completion. Consideration will be given to those with financial need. 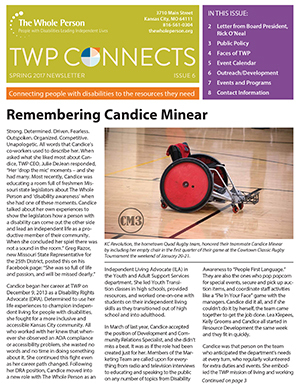 CLICK IMAGE to download our Spring 2017 print newsletter which has a feature article about Candice on the cover. The amount of the award shall not exceed $1,500 and disbursed payable to the student and the institution in one payment. The scholarship is not renewable. The applications will be reviewed by a committee established by The Whole Person and may include the Manager of Resource Development, member/members of Candice’s family, and the President of the Greater Kansas City Spinal Cord Association. The scholarship is announced in late Summer. Are you involved with a non-profit or any kind of community volunteerism? If you answered “yes”, describe the experience. Include name of organization, year/s participated, name of specific program in which you participated, activities in which you were involved, what you learned and personal development tools you acquired that will assist you with your educational and/or career endeavors. Describe the challenges you have faced because of your disability and the steps you have taken to address the challenges.